CrossFit is the principal strength and conditioning program for many police academies and tactical operations teams, military special operations units, champion martial artists, and hundreds of other elite and professional athletes worldwide. Since then it has evolved to be an all inclusive fitness program for people of any athletic capability. Our program delivers a fitness that is, by design, broad, general, and inclusive. Our specialty is not specializing. Combat, survival, many sports, and life, reward this kind of fitness and on average, punish the specialist. Be better than you were yesterday, and we’ll show you how to do the rest. I’m new to CrossFit, what should I expect? All members who are new to CrossFit will start with our Foundations course – our exciting introduction to the world of CrossFit, weightlifting and your new active lifestyle, will prepare you to reach your highest possible level of fitness. 9 sessions are required for anyone who is new to the CrossFit and weightlifting methodologies. Our primary goal in these small group sessions is to prepare you to join the group CrossFit classes with confidence. We will identify your own unique strengths and weaknesses, some of which are yet unknown, to hone pre-existing skills and begin to improve on the things that are holding back your athletic ability. First, you will learn how to lift safely and efficiently with lighter weight. Our focus will be on developing a strong technical base. We will slowly add more movements and heavier weight once you are ready. Under our guidance, you’ll have the chance to push yourself and put your new skills to the test. This program brings results! During your Foundations training, your body will begin to rapidly change. We’ll encourage you to take before and after pictures to help capture your transformation. In short, yes CrossFit can be dangerous. But not in the ways you might believe. With inexperienced coaches, shoddy equipment and the wrong attitude, CrossFit can be very dangerous – but so can riding your bike or driving your car. 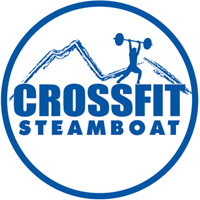 The experienced and proven CrossFit coaches you’ll find a CrossFit Steamboat will ensure that you’re training in the safest, most effective, and efficient way possible. A WOD is the workout of the day. We program a different WOD everyday. People’s fitness levels improve rapidly because we are constantly varying your training using functional movements at high intensity. Here at CF Steamboat we are more than just athletes that train to get in shape to be ready for what we love. We are a community of friends and family that work hard together and support one another in their fitness goals. Being accountable to others works to our advantage. We cheer each other on until the last person is done, we sweat and celebrate everything together. People come to CF to get in shape, to look better naked and to BE READY for the things they love to do but they stay for the amazing community of people. Feel free to contact us if you’re looking for something you can’t find here and we’ll reply back as soon as we can.